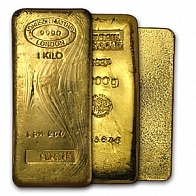 Brand new Swiss Made 1 Ounce investment grade gold bullion bars - Vaulted in Zurich. 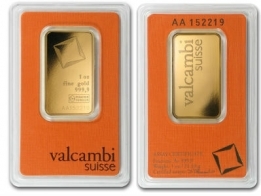 Gold bullion bars manufactured by Valcambi SA, Switzerland. 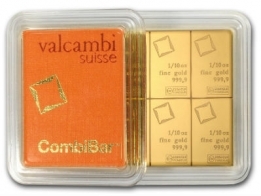 Each Valcambi SA gold bar sold contains 1 Ounce 999.9 fine investment grade gold bullion. 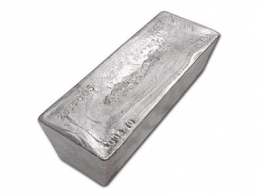 All bars sold are marked with the weight, size and purity of the metal on the front and are supplied with a matching assay certificate. These bars provide a great opportunity for clients seeking to create a diversified portfolio of precious metals holdings. Valcambi SA are recognised as a good delivery refiner by the LBMA and are of the highest quality available. Price includes free insured storage in our vault for up to one year from purchase date.